The year 2016 saw the first public presentation of Scholar reports. Three presentations from the 2015 group were delivered to an audience of some 60 people. It was a good opportunity to show what Nuffield is all about and to explain the richness of its global network of contacts. This is also the first year that Nuffield has been asked to set up a Portrait Gallery of innovative farmers at the International Agricultural Machinery Show in Paris. Concerning partners, new contacts have been made which should be formalized in 2017. 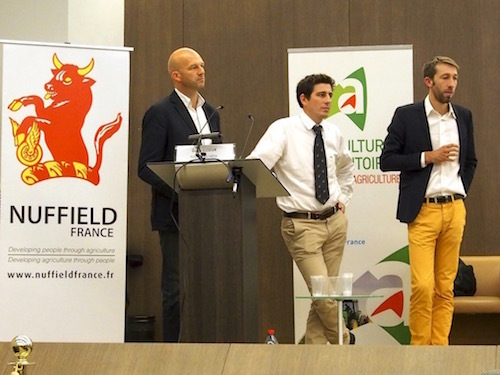 A new project for developing Nuffield France was adopted at the AGM in November. It will deepen the involvement of our partners in the life of the association whose aim is to contribute to the emergence of a creative, innovative, responsible and communicative agriculture. The selection board feels that quality of the candidates has increased significantly. The quality of the studies, the development of individual potential from the overseas visits and contacts, and the active support and effectiveness of the Nuffield network are beginning to be recognized in France and attract attention. 2016 was a disastrous year for agriculture in France. Cereal crop yields were poor and so were prices. There were structural surpluses in the milk sector and problems in the traditional livestock sector. Many farms face serious financial difficulties but this crisis will probably be the driving force for restructuring by those operators capable of taking control of their own destiny. About 30 per cent of farmers in France are real entrepreneurs and managers. They are the ones who will build French agriculture tomorrow with a clear focus on their farming practices, on the value-added of their products, and with less dependence on their professional organizations which have a tradition of strong commitment to defending models that are no longer relevant. The role of Nuffield President in France is a huge task because we do not yet have the capacity to finance an employee to manage daily operations. The situation is made more difficult by the limited commitment of former Scholars. This is why we have created a new project to develop the association involving both Scholars and partners who will ensure the development and secure the future for Nuffield France.